Dermal and subdermal fillers are sterile injectable substances of various compositions. These substances are injected into the dermal layer of the skin or the subdermal (fat or muscle) layers and they work by filling in the loss volume that is caused mostly by the natural aging process. They can effectively plump, fill and recontour the face to provide a nonsurgical youthful appearance by way of volume rejuvenation. Facial volume replacement may include a combination of fillers in different layers of the skin for a more effective result. Dermal and subdermal fillers are incredible in providing a nonsurgical youthful look. These fillers by adding volume can rejuvenate the face causing reduced wrinkles, reduced lines, and reduced folds on the face, such as with: smile lines, laugh lines, parenthesis lines around the mouth known as nasolabial folds, smoker's lines, forehead lines, crows feet, frown lines between the eyes known as glabellar lines. They can add loss volume to cheeks or eyes and add loss volume or add volume to enhance the lips. They can add volume to fill in depressed acne or other facial scars and can even add volume to improve jaw-line or chin. There are a number of dermal and subdermal fillers made by different companies each has its suited purpose and limitations when used. While dermal and subdermal fillers are relatively safe when properly selected for the result wanted and properly injected they are not without potential side effects. As with any medical treatment or procedure there are inherent risks and potential complications that can occur. Most fillers have the same risks and side effects. The most common side effects are bruising, redness, discomfort, tenderness, rash/itch. The most common side effects with most fillers happen shortly after injection and most go away in less than 2-3 weeks. There may be other less common side effects that include but are not limited to infection, allergic reaction, raised lumps in or under the skin that may require surgical removal, formation of permanent hard nodules in the face, sore at injection site, movement of filler material form site injected and intended, injury to blood supply if inadvertent injection of product into a blood vessel, draining wound, necrosis (tissue death), vision abnormalities including blindness risk with fillers used around the eye. This list is not meant to be inclusive of all possible risks associated with dermal and subdermal fillers as there are both known and possibly unknown side effects and complications that may occur for which medical intervention to resolve complications may be required. You are encouraged to do your own homework prior to proceeding with any dermal and/or subdermal filler treatment and to answer for yourself whether potential risks are worth the treatment. Multiple fillers at different layers of the skin may be used in the treatment of a patient. Consent forms specific to each filler that is to be used is reviewed and required pretreatment. Additionally, a full medical history and history of previously used fillers or facial aesthetic materials/facial implants or surgeries is required pretreatment to determine if you are a candidate for the facial rejuvenation services available. Bruising is one of the most common side effects. Note pretreatment and post treatment tips that can help avoid bruising is to avoid for 1 week prior to treatment anything that can increase your chances of being prone to bleeding such as: Aspirin, Ibuprofen (Motrin, Aleve, Advil), Excedrin, Vitamin E, Omega 3 Fatty Acids, Ginseng, Ginko Bilboa, St. John's Wart. Patients on blood thinners are not candidates for cosmetic injectable facial fillers at this office. Other tips that can help avoid the most common side effect of bruising are: no alcohol drinking for 2 days before and 2 days after injectable facial fillers, avoid flying for 2 days after treatment, Arnica Montana is recommended on the day of treatment and continuing for 3 days after, the regimen is discussed pre and post injectable facial fillers, should consider rescheduling treatment if cold sore present or any open skin on face. During treatment if bleeding is noted pressure may be applied and ice to that spot. After treatment ice packet will be dispensed with instructions on its application. If bruising is expected auriderm topical ointment will be recommended with instructions on use after treatment. Other tips: avoid exposure to heat, cold and sun for up to 2 weeks following injections. It is important to apply sunscreen and to avoid using products that contain alcohol on the face. These fillers come in a variety of materials and from a variety of companies. The original dermal fillers were collagen based and required allergy testing one month prior to treatment. The reason for the allergy testing stemmed from the fact that the collagen derived from cow collagen (bovine), pig collagen (porcine) as well as human collagen. The most popular fillers now are the hyaluronic acid or HA fillers which do not require allergy testing prior to treatment. Popular HA fillers used today are Juvaderm, Belotero, Captique, Hylaform, Restylane, Perlane. 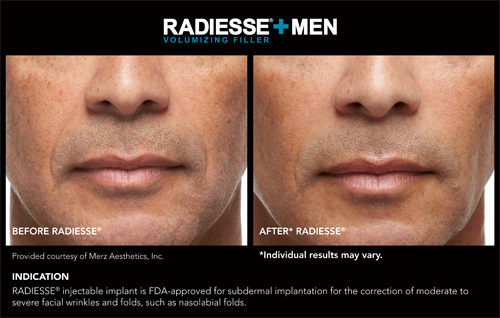 There are other types of fillers that are not HA fillers that are popular today such as Radiesse which is a calcium hydroxylapatite or bone cement, Artefill (polymethylmethacrylate/PMMA microspheres in bovine collagen), Silicone, Sculptra (poly L Lactic Acid) and fat. Dermal and Subdermal Fillers that are most commonly used at this office include but are not limited to Juvederm (all formulations), Belotero and Radiesse. All dermal and subderamal fillers used are FDA approved. Juvederm is an injectable facial filler that relies on hyaluronic acid/HA vs collagen to fill or plump the skin and comes in different formulations. As noted it is a HA filler. Both Hyaluronic acid/HA and collagen are natural substances in the body and in the skin. Hyaluronic acid/HA is a natural sugar complex found throughout the human body and skin and creates volume, hydration and elasticity. The hyaluronic acid/HA in juvederm is created by biosynthesis in a laboratory and is FDA approved. Juvederm is approved and used to fill and smooth moderate to severe facial wrinkles and folds. As you age, the skin goes through changes. One of those changes is the reduction in the production of hyaluronic acid/HA which contributes to the formation of facial wrinkles and folds. Juvederm is a HA injectable gel. The difference with the use of Juvederm is seen immediately. Juvederm will instantly smooth out a wrinkle and folds and is known for providing a smooth natural look and feel. Juvederm Ultra/Juvederm Ultra XC (includes lidocaine), Juvederm Ultra Plus/Juvederm Ultra Plus XC (includes lidocaine), Juvederm Voluma XC. The different formulations have different texture, hardness, ability to lift and duration in the skin. The choice of which formulation is to be used is determined by the injector of this HA filler based on which formulation would be best to use for the area to be injected and the result that is wanted to be achieved. Consideration is also given to the costs the patient is willing to spend on facial rejuvenation and history of the patient. Juvederm Ultra is best used for filling moderate wrinkles: smile lines and marionette lines (lines that run from the corners of the mouth to the chin and can be very prominent), contouring, scar correction, moderate lip enhancement. Its duration varies but per the manufacturer it can last up to 9 months. HA Dermal filler. Juvederm Ultra XC same uses as Juvederm Ultra only difference between them is that Juvederm Ultra XC has lidocaine in its formulation. HA Dermal Filler. Juvederm Ultra Plus is best used for filling severe wrinkles: smile lines and marionette lines, adding more significant volume to lips, correcting of nasolabial folds, facial shaping. Its duration varies but per the manufacturer it can last up to 12 months. HA Dermal Filler. Juvederm Ultra Plus XC same uses as Juvederm Ultra Plus only difference between them is that Juvederm Ultra Plus XC has lidocaine in its formulation. HA Dermal Filler. Used for the cheeks because of its thickness and ability to provide required lift and support that the soft tissues of the cheeks need. This is the thickest formulation and usually lasts up to 2 years. HA Subdermal Filler. The areas that juvederm can treat include the face, including lines and creases around the mouth, nose, forehead. It can be used for facial contouring. It can be used on facial scars such as acne scars. It can be used to enhance the lips size and shape. Also as noted it has a specific formulation to add volume providing lift and support to cheeks. The benefit of Juvederm all formulations is the softness and naturalness of the results. Prior to being treated with Juvederm patients are advised to not take or to stop taking any anti-inflammatory medications or aspirin for 7 days prior to treatment. Topical lidocaine gel is applied prior to treatment the filler is injected in the areas of treatment. After treatment an ice packet may be dispense. The treated area should not be massage or press on by the patient for a few days. Also the patient should avoid exposure to heat, cold and sun for up to 2 weeks following injections. It is important to apply sunscreen and avoid using any products that contain alcohol on the face. Follow-up visit is given for 2 weeks post treatment for any recommended touch ups needed at cost. Overtime the hyaluronic acid/HA is absorbed by the body. 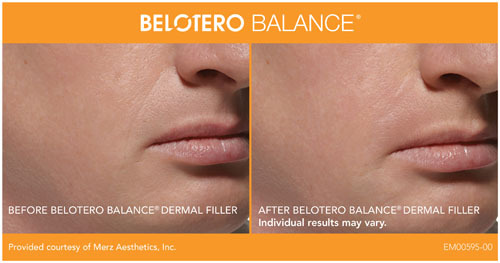 Belotero is a resorbable FDA approved hyaluronic acid/HA based dermal filler. This HA dermal filler is ideal for fine lines and superficial wrinkles. It easily makes fine lines and superficial wrinkles disappear providing instant smooth and natural results. The filler is often not felt under the skin like other fillers. 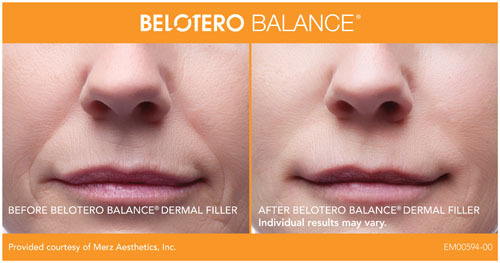 It is often used in treatment in conjunction with other dermal fillers in a layers approach wherein Belotero deals in the treated area of another filler to treat the superficial lines and wrinkles closer to the surface to get a more complete and younger look. It is injected with a very fine needle. It can last from 6 to 9 months. 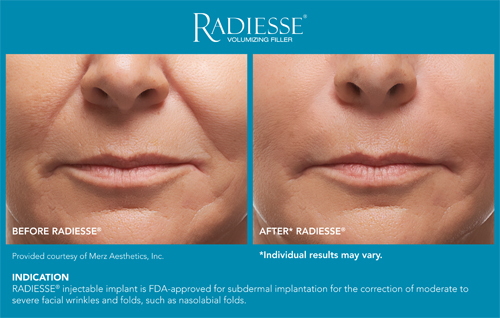 Radiesse is a subdermal filler but can be used in deep dermal areas. 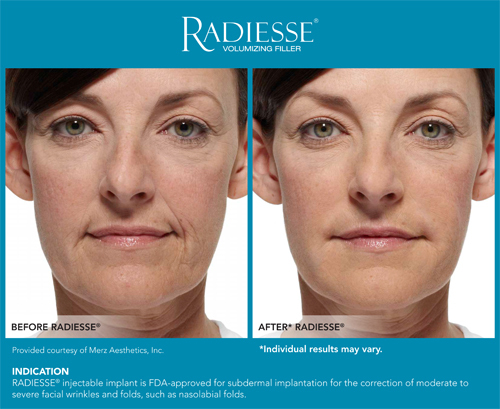 Radiesse principal component is synthetic calcium hydroxylapatite, a biocompatible material with over 20 years of use in medicine. The semi-solid nature of Radiesse is created by suspending calcium hydroxylapatite microspheres of 25-45 microns diameter in a gel carrier of carboxymethylcellulose. 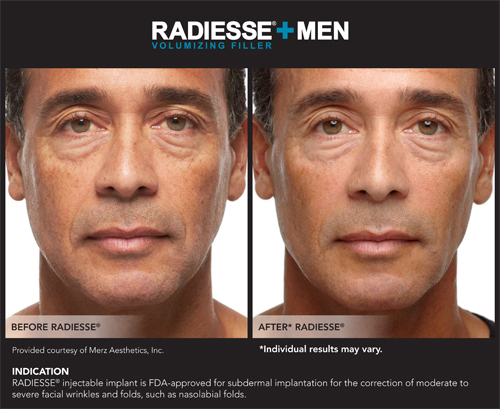 The product is FDA approved for facial aesthetic augmentation. It provides immediate lift and volume acting like a scaffold under the skin and it stimulates your own natural collagen to grow. After injection the new collagen tissue is stimulated to produce naturally. 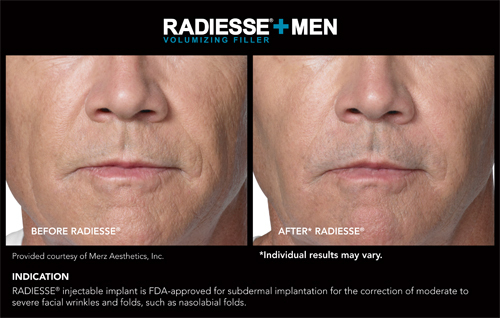 The natural collagen growth continues for several months after the initial effect of Radiesse volumizing filler has diminished. The result is immediate and lasts for up to a year in many patients. After time the calcium based microspheres are metabolized by the body leaving behind your own natural collagen. This filler is ideal choice for larger volume filling with the added benefit of its unique stimulating effect. This filler beautifully provides strong uplift and volume to the cheeks. Like hyaluronic acid/HA collagen is a natural substance in the body and skin. Natural collagen gives skin a smooth, supple, youthful appearance and with the aging process collagen breaks down contributing to facial wrinkles and volume loss. 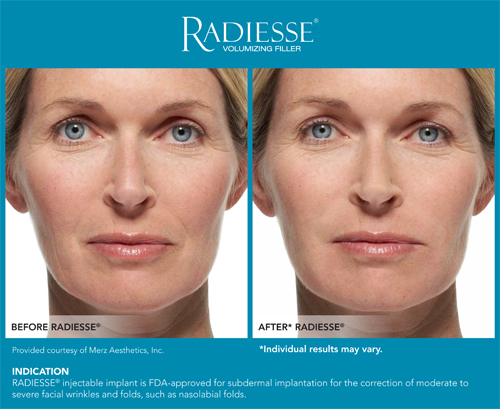 Radiesse is a volumizing filler that stimulates your own collagen production. 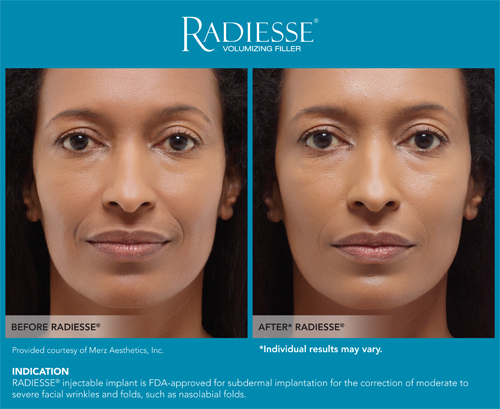 Patients are advised prior to Radiesse treatment just as with the HA fillers not to take or to stop taking any anti-inflammatory medications or aspirin 7 days prior to treatment. Topical lidocaine may be applied, infiltration or nerve block injection may be given. Ice Packet is dispensed post treatment. The filler material may be massaged and modeled to ensure even placement and to avoid an uneven result or appearance. This massage is done by the person doing the placement of the filler product and not the patient.